Earn Bitcoins by completing online promotional offers, installing mobile apps, and more. We're the first Bitcoin CPA affiliate network that allows you to earn Bitcoins by completing online promotional offers. Receive your Bitcoins within 24 hours of earning. 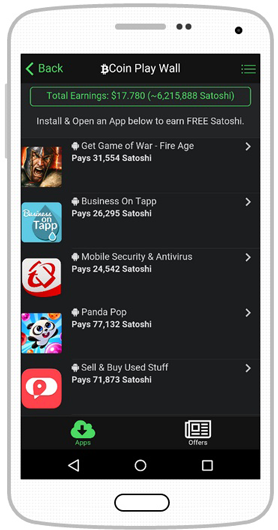 In addition to our innovative dashboard, we have a mobile app that allows you to earn Bitcoin by installing apps for free. Browse over thousands of offers, pick any that interest you. Follow through the offer filling out any information needed, or participate in the offer promotion. Bitcoins get deposited into your wallet daily. Over 300+ mobile apps available. Over 4000+ online promotional offers available. Multi Platform - Applications available for both Android and iOS phones. Use your Offer Affiliate Links to promote offers anywhere on the web, get paid bitcoins when other people fill out your offers. Earn permanent payout bonus increases by ranking up! We have a generous referral system, Earn 10% referral earnings from anyone who signs up using your referral link. Use our Offer Wall technology to browse available offers. Monetize your website with our embeddable Offer Wall tool. 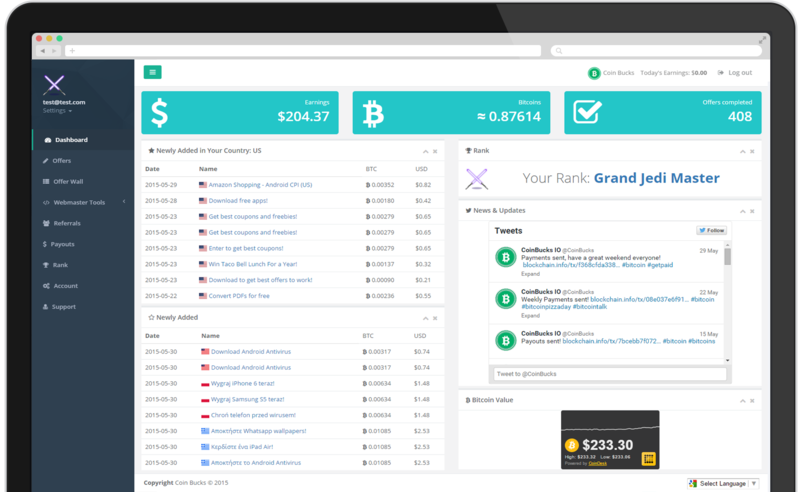 View all your stats in our innovative dashboard, browse offers, get affiliates links, and more. Copyright ©2015 Coin Bucks. All Rights Reserved.